David Stepan creates Fine Art for food and decor. Extraordinary charcuterie cheese boards, hand hammered copper cheese tools, beautiful clocks, and accessories. Stepan explores art, service, and decor featuring the peculiar grains of wood, stone, and the warmth of hammered copper. 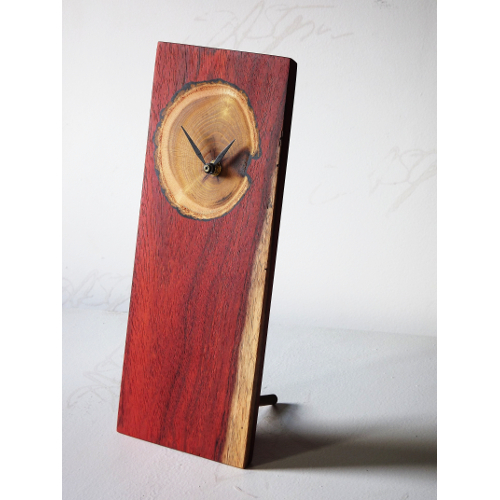 A tree captures and measures time in its annual growth rings...and this section of Mulberry plays on that, making a handsome natural clock face. David Stepan artfully inlays the growth ring section into a variety of background species, creating a modern time piece. The inlay inspires curiosity, is contemporary, surreal, yet approachable. A popular gift for him, it is a warm modern piece for any room. It employs a continuous sweep quartz movement, silent, so no annoying ticking sound. 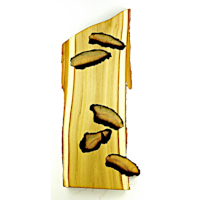 Designed to hang on the wall or stand on a surface with the supplied leg. Available in MINI, MEDIUM, and LARGE in a variety of species. A MINI Charcuterie Board, functional fine Art. This example in ebonized and distressed white oak, with an inlaid growth ring section of Hemlock salvaged from the 2016 Seven Mile Lake Forest Fire near Kejimkujik National Park in Nova Scotia, Canada. 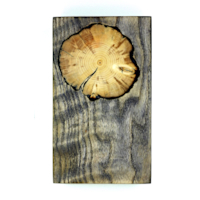 The backs of all boards are notched to allow hanging landscape or portrait. 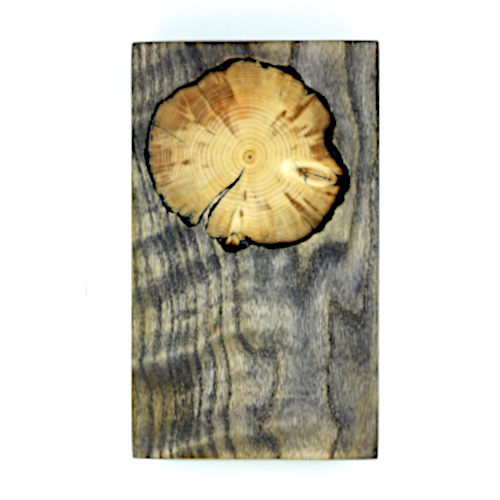 It is my intention that our boards be enjoyed as art, inviting curiosity, perhaps reminding the viewer of the simple pleasure of measuring time by counting the growth rings; or that something beautiful can come from that tragic fire. It is also intended to be used in service. Imagine some salmon sashimi with wasabi popping off that board. Supplied with a flocked vinyl presentation case. A small hand hammered copper bowl, perfect for chutneys, soya, and sauces. Unashamedly handmade. The energy of the hammerstrike is captured in the finish. 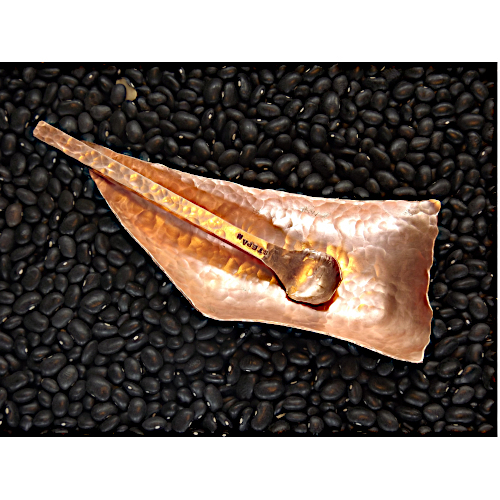 The scallop of the edge develops with the cold forged blows of the hammer, reinforcing the organic way the piece develops under the hammer. 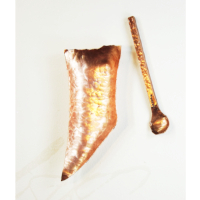 Shown with a hand hammered copper preserve spoon to give it context. The spoon rests handsomely on the handerkerchief corner of the bowl. An ART charcuterie board. Boards that are created with extraordinary features become part of our ART charcuterie board series, less formatted and absolutely one of a kind. 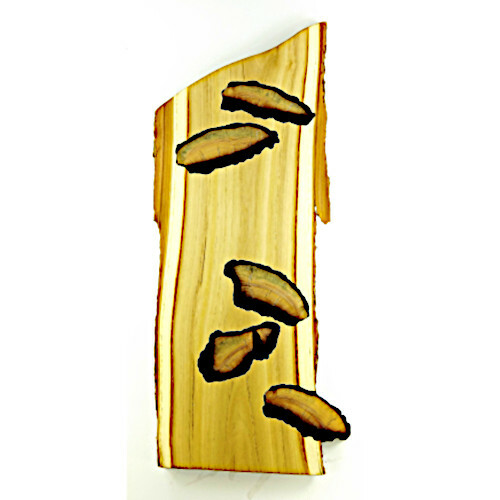 This piece is an example in Nova Scotian Tree of Heaven, with inlaid sections of forest fire Hemlock from the 2016 Seven Mile Lake forest fire near Kejimkujik National Park, and 16km from our home. We create these in many species and sizes, and each invites the story of its provenance. All of our boards are notched on the back for hanging. Finished with a tung oil finish, they are intended to hang as ART, and be used in service.